Raise money with custom t-shirts is a great way to reach the revenue goals of your particular fundraising. The boring part: Studies show people are more likely to donate when they receive a tangible item in return. Now that we have the scientific reason out of the way we can begin talk about the fun parts. Everybody loves t-shirts and you have to look no further than out your window no matter where you are. With the boost of websites that promote fundraising so to will the custom t-shirt follow suit. However, unlike the website that strictly offer a place to donate, per volume sites where a tangible item is gifted back to the donor have an increased volume in funds. 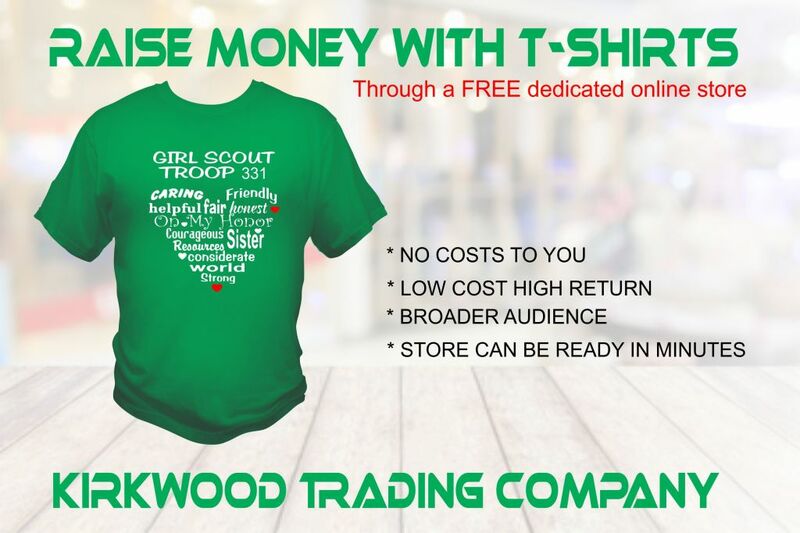 Kirkwood Trading Company offers people the ability to raise money with custom t-shirts through an entirely 100% free dedicated online store. We can use your design or ares. Typically there are 3 options when it comes to design. Either way if fine with us. Our goal is the same as yours, to help you raise as much money as possible for your fundraising campaign. To raise money with custom t-shirts is a unique way to give a really cool gift back to the donor that is personally attached to their donation effort. Whatever your focus or your goal, a custom t-shirt is a low cost item that makes a great gift. As stated above it’s personally attached to the purpose and people enjoy getting something in return no matter how big or how small. Successful campaigns we have run have been with a simple client approve design that had a cost of between $5-$7 but a fundraising price of $20.00. The they are getting roughly $4 dollars back for every dollar invested. The fact that people are getting some tangible back rather than simply donating money has proven to make more people prone to giving. 100 shirts with a fundraising differencial of $15 means a profit of $1,500. Think about that for a minute. We have all seen the online fundraising sites and causes where people give $1, or $5, or $50 but the donors list is small. There is no incentive to give a specific amount, people give what they can God bless them. But if you are trying to make money and have something specific like a cool t-shirt that is given in return for say a minimum donation of $20.00. Now you have people who are happy to donate but in their psyche is feels more like a purchase. You Get it. That is the power of using a custom t-shirt for a fundraising project. We have done projects where a few hundred shirts were sold and we’ve done fundraising projects where a few thousand shirts were sold. It’s all about the cause and what the donor gets back. Kirkwood Trading Company will be happy to discuss options with you on your next fundraising campaign. We’ll show you how to raise money with a custom t-shirt and just how easy it is to get a fantastic return.